Edgewood at Belleharbour community is sold out and is not in active development by builder. If you are interested in Edgewood at Belleharbour or similar new home communities, contact us today! Our agents are very familiar with new and newer construction in Suffolk, and can identify resale opportunities in Edgewood at Belleharbour, as well as builder inventory available in nearby or similar communities in Suffolk. To view 21 more pictures, interactive maps and the full, detailed description of the Edgewood at Belleharbour community, please Login. New construction properties abound in Edgewood at Belleharbour. This nicely appointed real estate for sale is picture perfect with its serene surroundings. Settling down in Suffolk, VA, certainly does not mean settling for less in this development. Nearby military bases Norfolk Naval Shipyard and Coast Guard Base Portsmouth allow for easy commutes while shops, banks and schools are closer still. Real estate for sale in Edgewood at Belleharbour gives homebuyers value and quality. A commitment to high standards is maintained throughout this new construction. Each of the properties here may come with full brick skirt, 30-year architectural shingles, satin chrome front door hardware, patio complete with privacy fencing, Wayne-Dalton overhead garage door and more. A homebuyer actually can judge a book by its cover in properties at Edgewood at Belleharbour. The outside is just the beginning to what awaits a potential resident inside this real estate for sale. Every one of the new construction homes may feature satin chrome door hardware, eat-in kitchen, GE garbage disposal, kitchen pantry, bath exhaust fan, energy-efficient low-e windows, quick-recovery 50-gallon gas hot water heater and much more. Out of the hustle and bustle of Hampton Roads lies the lively city of Suffolk. This area of Virginia is home to new construction along with some of nature’s most picturesque scenes. Enjoy the great outdoors at Bennett’s Creek Park. This facility offers boating, fishing and crabbing. Visitors can swim, play on the playgrounds, hike a nature trail, play tennis or have a picnic. Golfers can take advantage of properties like the Riverfront Golf Club that invites a challenge on its waterfront course. When looking through real estate for sale, it can become easy to get weighed down with all the details. Asking two questions can keep your mind on the right course. Does this house look and feel like the place you and your family belong? Is this the place where you picture yourself in the next five years and beyond? In a home at Edgewood at Belleharbour, these questions are easily answered. 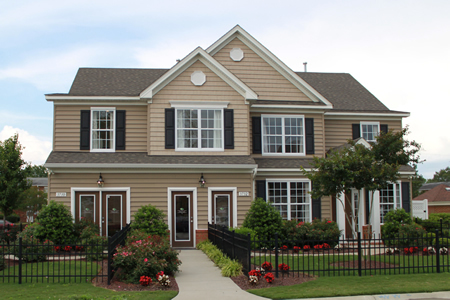 Send me more information about communities similar to Edgewood at Belleharbour. Our agents gladly offer FREE property tours of Edgewood at Belleharbour, Suffolk and homebuyer consultations to all serious buyers.